Many of you know Dan and Tori Beaver, who have ministered in the Philippines for many years. A fire in Boracay, where they serve, has destroyed their ministry center. ESTIMATED 1 HECTARE, 30-50 HOUSES/COMMERCIAL BUILDING WERE BURNED DOWN BY HUGE FIRE TODAY AT . Below is a message from the Beavers reposted from Facebook. Click here to see video footage of the file, which was posted on Facebook. Dan is preparing now to fly back to Boracay from our family time in the USA. All our kids and grandkids just arrived Christmas California. Below is a story from rappler.com: click here for the complete story and photo. BORACAY, Philippines (Updated) – Ten people sustained injuries in a Christmas eve, December 24, fire in Boracay Island that left up to 60 families including dozens of children homeless. 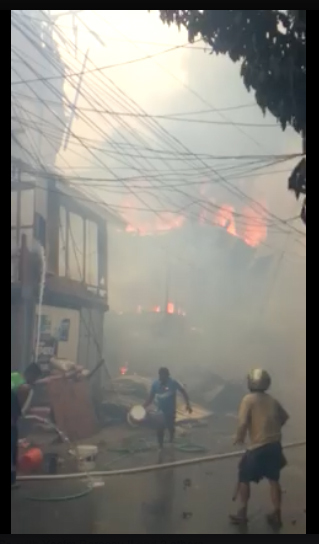 The fire that started at Sitio Ambulong in Barangay Manoc-Manoc at around 10:45 am Thursday quickly swept through the main road and through the two-hectare property near the Muslim community compound, a dense residential area. Fire trucks of the Bureau of Fire Protection (BFP) Special Fire Protection Unit Boracay and volunteer fire brigade groups were quick to respond but the fire was only controlled at 1:05 p.m. Houses made of light materials were totally destroyed. The fire damaged approximately P10 million worth of properties. Establishments Alevir’s Trading and Sespene Trading, both located on the main road, were also gutted by the fire. When the fire broke out, traffic in the main road was re-routed by the Boracay Tourist Assistance Center (BTAC) to the circumferential road. The fire also interrupted power service on Boracay Island. Click here for the complete story and photo.